We are engaged in offering Coop Cups with Hook, manufactured by our adroit professionals, armed with wide industry-experience and immense knowledge in this domain. 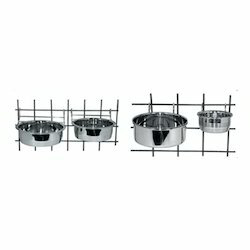 These products are manufactured using topmost stainless steel with the aid of latest techniques and machines in complete compliance with the set industrial norms. We are offering Coop Cups to our clients. Our customers can purchase from us a range of coop cup nut pet Bowl. Known for their perfect finish standards. Moreover, these have light weight and also made using quality stainless steel. In addition to this, these are quality tested on different parameters. Our customers can purchase these at industry leading prices. In order to fulfill the ever-evolving demands of our esteemed clients, we are engaged in providing an optimum quality array of SS Coop Cup Bowl. Petmeg Exports Coop-Cup with Wire Hanger and nut is perfect for birds, dogs, cats and other small animals. Coop cups with wire hangers. 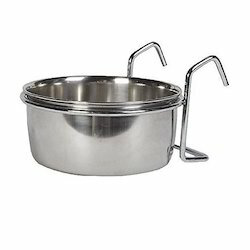 With different styles and sizes, coup cups with hangers are available for easy placement.